Firstly, GMT Granite Tri Square finds application for checking the X-Y-Z axes on CNC machines, milling machines, CMM’s. Furthermore, it’s made of Indian Black Granite and provided with through-holes for weight reduction and ease of handling. Therefore all 6 sides are lapped to maintain flatness, squareness and parallelism. Consequently, GMT Granite Tri-Squares provide an excellent, economical way for accurately checking the X-Y-Z axes. Hence, it finds application on CNC machines, milling machines and coordinate measuring machines. Besides, GMT Tri-squares finds uses in the same manner that steel squares for the direct checking of straightness and squareness. Place it in the horizontal position (the X and Y axes) to check for 90° squareness. Furthermore, with the square in the vertical position, tracing along the vertical edge of the square can check the perpendicularity of the Z axis. Tri-Squares have 6 finished faces. Granite Tri Squares to check X-Y-Z axes. Precision tri squares are available in Laboratory Grade or Inspection Grade. 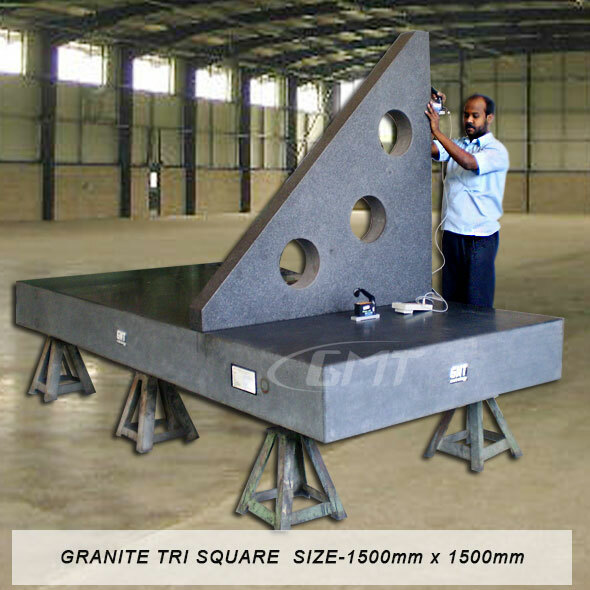 GMT granite tri-squares are made from famous Indian Black Granite. Indian Black granite has a heavier density and is made of a finer grain. Provides strong, durable and stable surfaces. Does not flake out in sections. GMT Black granite tri squares are more durable and help to avoid scratching. Apart from the above sizes, Guindy Machine Tools also manufacture Tri Squares as per customer requirement. Shown below is a special extra large sized Tri Square manufactured by GMT. Also, please visit us at https://gmtmachinetools.blogspot.in – a new blog dedicated to all GMT customers…interact with our technical experts.